Ratna Nidhi Charitable Trust, which is run by Mahendra Mehta and his wife Asha, brings hope and gives a second chance at life to thousands of physically handicapped people across India. 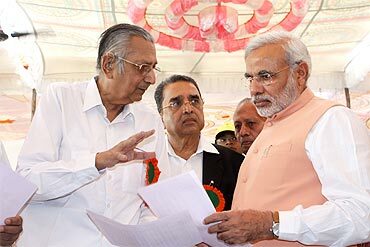 Mehta, 78, set up the trust nearly nine years ago. "We started with the physically handicapped people and then recently included the hearing disabled too," he says. When queried on why Mehta, a businessman, decided to start the trust, he replies, "I have been in the diamond and jewellery business for 48 years. When a person grows older and his children are settled, he begins to think about other things. When I thought about what will make me happy, I decided to help the underprivileged who need support. I believe that true joy is derived from watching the happiness of others and double joy can be experienced when they are happy because of you." "I was afflicted by polio when I nine years old and lost my right leg," says Sudhir Dalve, 38, who works with the Fellowship of the Physically Handicapped in Haji Ali, south Mumbai. Thanks to the Ratna Nidhi Charitable Trust, Sudhir now walks with help of a calliper splint (a surgical appliance that is used to correct or control the deformity of a joint in the leg. It consists of a metal bar that is fixed to a shoe and held to the leg by means of straps). 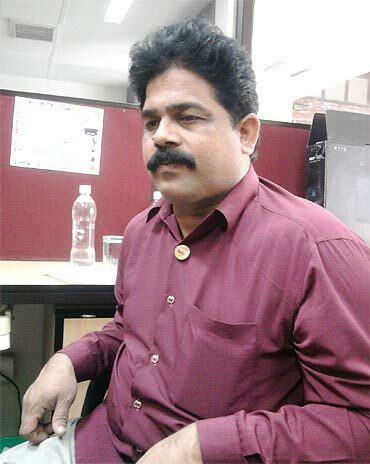 Sudhir works with the FPH and makes wheelchairs, tricycles, walkers and elbow crutches. He went to one of the camps the trust had conducted at the Cricket Club of India, Mumbai, where he was gifted the callipers. The couple recently organised their largest charitable health camp in Palitana, Gujarat, where more than 28,000 people with different handicaps were gifted hearing and walking aids. "We prepared for more than six months for this camp. We have held many such camps but on a smaller level; this was by far the biggest we did. Nearly 40,000 people came for the camp but unfortunately we were able to help only 28,000 of them," recalls Mehta. Ask him how people get to know about these camps and he proudly says, "We first do diagnostic camps for about two months, where we go to the places and make an analysis of how many children are affected and what kind of help they need. We leave behind our brochures and feedback forms with them and tell them when our next camp will take place. They come for our camps and we try our best to help them." Another beneficiary is Naina Rajkumar Jaiswal, whose one leg has been shorter than the other since birth. Though the family tried to diagnose what the reason is, they couldn't find out why she was born with one short limb. With the help of her compounder father, who works at a private clinic, the 20-year-old was taken to a local hospital where she was given a alse foot. "But that was very uncomfortable. It was very heavy and would cause a lot of pain in my hip," Naina recalls. Nearly, six years ago she got to know about Ratna Nidhi Trust and now she wears a Jaipur Foot. "My mother's cousin works with the trust and she suggested that I wear the artificial foot they give me. It is very comfortable and lightweight. I don't have to face any problems because of this," says a grateful Naina. She is currently studying in the ninth grade at the Usuf Mahurally Vidyalaya in Tardeo, south Mumbai. Though the Mehtas want to help as many people as possible, their mission requires extensive funding, as the trust does not take any money from the beneficiaries. "We concentrate mainly on helping children. Financial aid comes from across the world, through communities and friends from the United Kingdom and the United States. We somehow manage to procure the equipment and cater to peoples' needs," he says. The trust manufactures the equipments themselves with the help of medical practitioners and specialists who take measurements during the diagnostic camps. 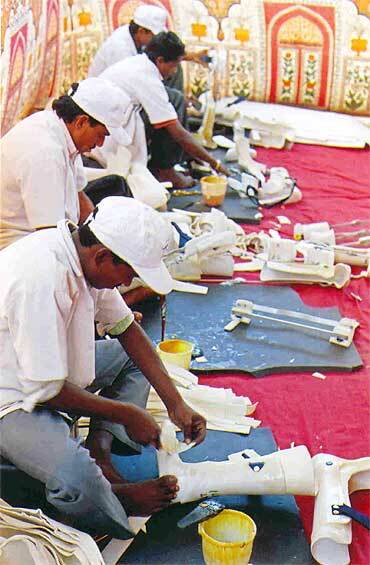 They have approximately 60-70 staff members who make hearing aids, callipers, the Jaipur foot and prosthetics. 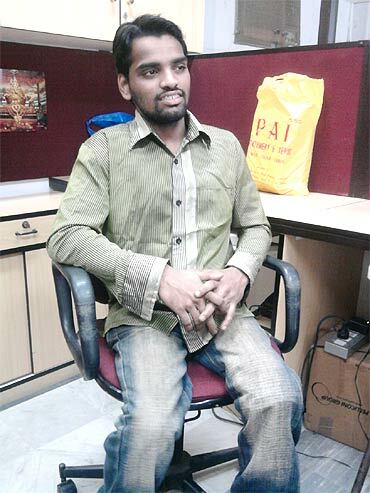 Another beneficiary is Milind Bhole, 23, from Ghatkopar, a Mumbai suburb, who works with Sudhir. Milind too had polio when he was a year and a half old and lost the use of his left leg. The shy boy took Sudhir's help for the conversation. He apparently can converse exceptionally well in sign language, "because he has a girlfriend who is deaf. She too wears the hearing aid given by the trust and someday Milind wishes to marry her," informs Sudhir. Milind, who wears callipers made by the Ratna Nidhi Trust, feels that his life is much better now. "I had a few operations to rectify my disbility but nothing helped. I wore callipers given by someone else but they were very uncomfortable. It would break often and pain a lot. Through Sudhir, I got to know about the Ratna Nidhi Trust and after they gave me these callipers, I don't think I have a defective limb," he says. Apart from helping children with such handicap aids, Mehta also teaches the basics of management and business to street children. He has also committed to provide five years of education to the child victims of the 26/11 terror attacks. 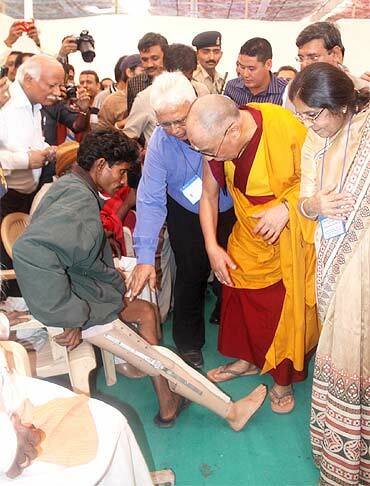 He has also conducted camps at Dharamshala where the Dalai Lama visited his camp and extended his help.